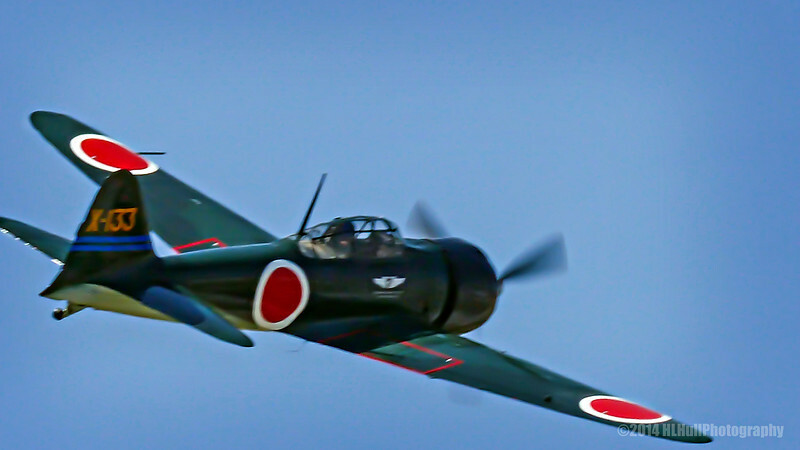 Completed in May 1943, Zero No 61-120 was the 2,357th aircraft of its type to come off the Nakajima production line and was first assigned to the Japanese Naval Air Corps on the home island of Honshu. In a few months, it moved to Iwo Jima, then in March 1944, was reassigned to Asilito Airfield on Saipan. On June 18, 1944, U.S. Marines captured Asilito Airfield with a number of intact Zero fighters. A dozen of these intact Zeros were shipped to NAS North Island, San Diego, California, USA for evaluation. Four Zeros were restored to flight, two went to the Army Air Force and two were retained by the Navy. The Museum’s Zero No 61-120 was ferried to NAS Patuxent River, Maryland on August 23, 1944 and subsequently flown by about 25 different USN, USMC, Royal Navy and civilian fighter and test pilots, including Charles A. Lindbergh. The aircraft was ferried back to San Diego on January 11, 1945, where frontline combat pilots were also given a chance to check out the Zero. Altogether, Zero No 61-120 logged over 190hr of flight time in the USA before being declared surplus after the war. Zero No 61-120 wound up being sold for scrap, but Mr. Ed Maloney obtained it in 1951 for his Air Museum in Claremont, CA, which opened in 1957. The Museum began restoring the Zero to flying condition in 1973 and after 4½ years it flew again on June 28, 1978. The Museum’s Zero is the only fully authentic flyable example in the world. Restored to flying condition in June 1978, this Zero fighter is still powered by its original Nakajima Sakae 31 engine. It carries the same color scheme and markings it bore in combat for the Imperial Japanese Navy during the war. After a successful flight-test program the Zero was shipped to Japan for a six-month tour of flight demonstrations. Two tours have been made in Japan and is the only example of the type of Zero to have flown in Japan since the end of WWII. Once flown by Charles A. Lindbergh at NAS Patuxent River, Maryland. Terrific shot and I love the POV! A rare sight, an air-worthy Zero in flight. Another amazing shot & info Howard!